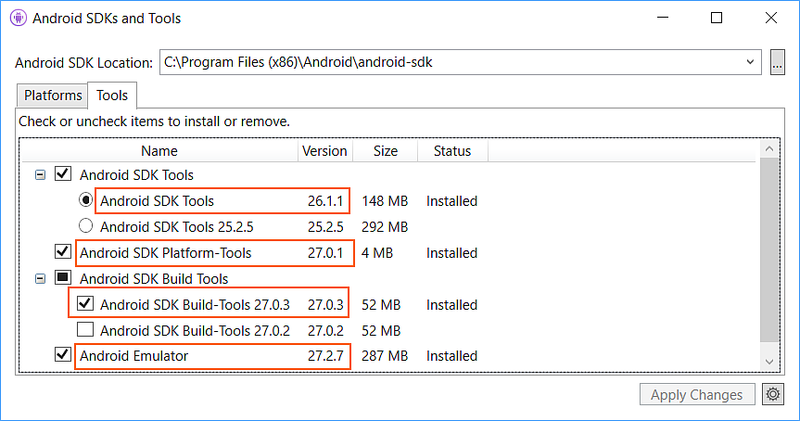 This article explains how to use the Android Device Manager to create and configure Android Virtual Devices (AVDs) that emulate physical Android devices. You can use these virtual devices to run and test your app without having to rely on a physical device. 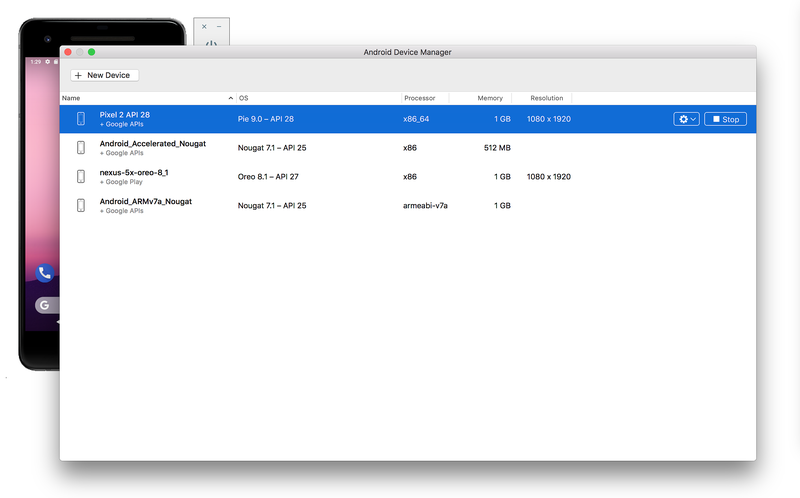 After you have verified that hardware acceleration is enabled (as described in Hardware Acceleration for Emulator Performance), the next step is to use the Android Device Manager (also referred to as the Xamarin Android Device Manager) to create virtual devices that you can use to test and debug your app. This article explains how to use the Android Device Manager to create, duplicate, customize, and launch Android virtual devices. You use the Android Device Manager to create and configure Android Virtual Devices (AVDs) that run in the Android Emulator. 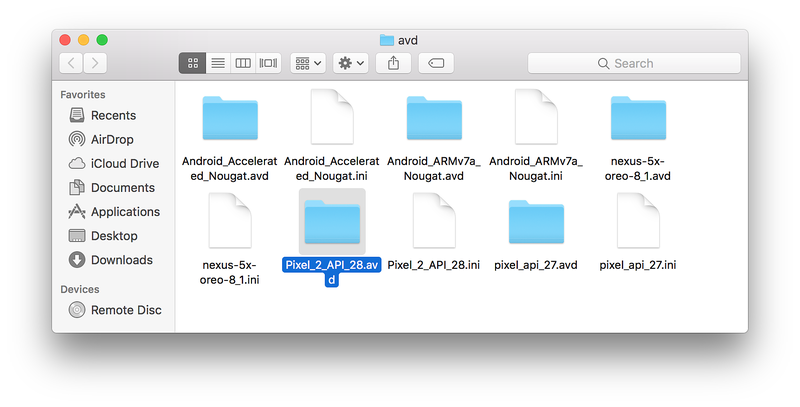 Each AVD is an emulator configuration that simulates a physical Android device. 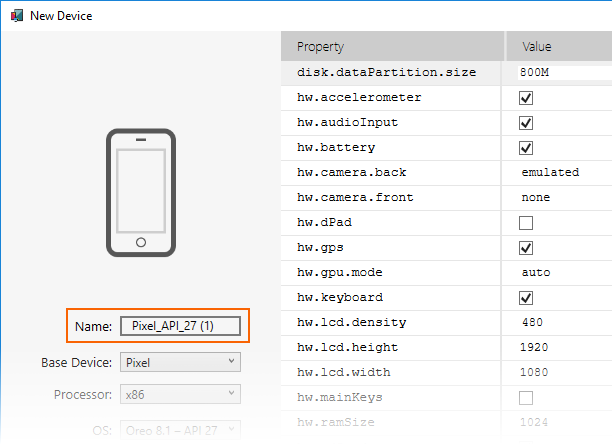 This makes it possible to run and test your app in a variety of configurations that simulate different physical Android devices. Visual Studio 2019 Community, Professional, or Enterprise. OR Visual Studio 2017 version 15.8 or later is required. Visual Studio Community, Professional, and Enterprise editions are supported. 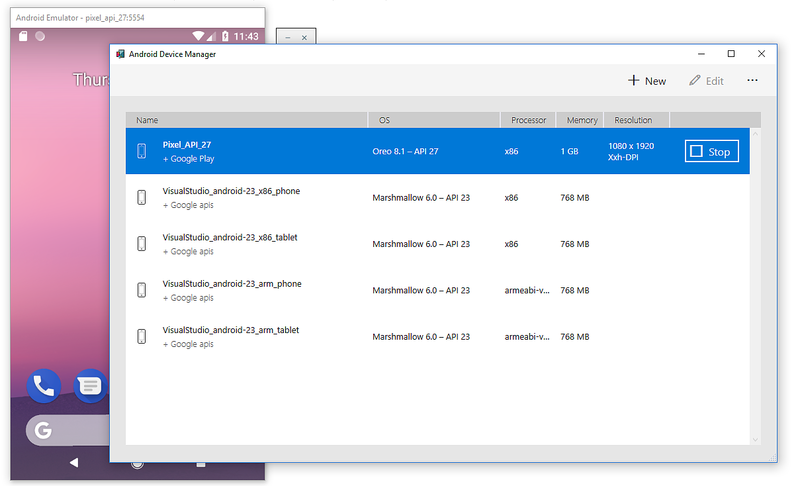 Visual Studio Tools for Xamarin version 4.9 or later. 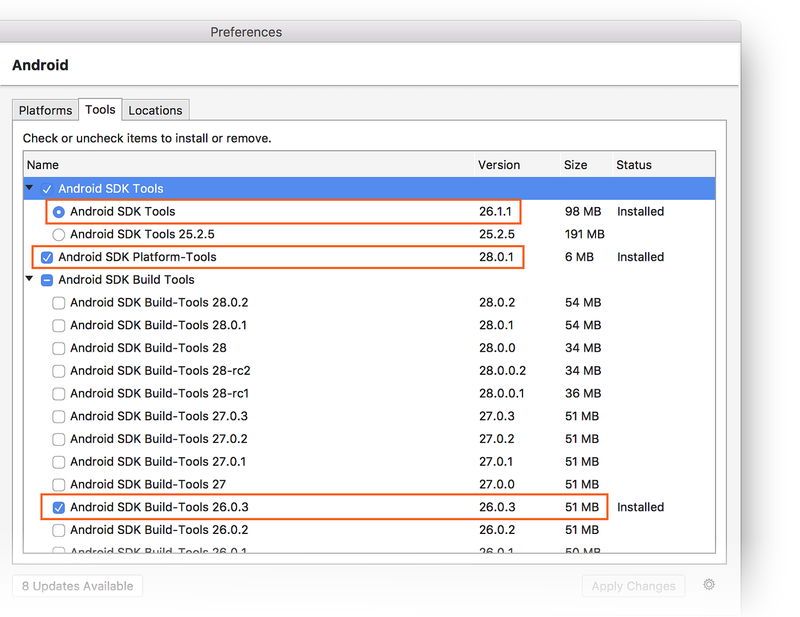 The Android SDK must be installed (see Setting up the Android SDK for Xamarin.Android). 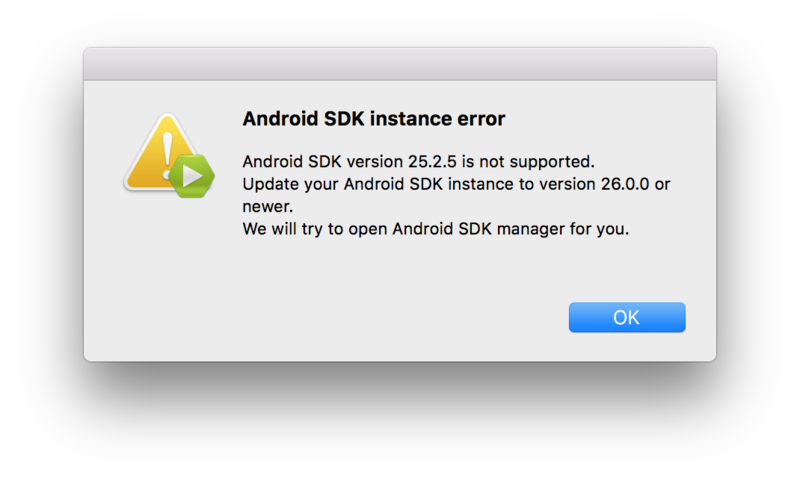 Be sure to install the Android SDK at its default location if it is not already installed: C:\Program Files (x86)\Android\android-sdk. 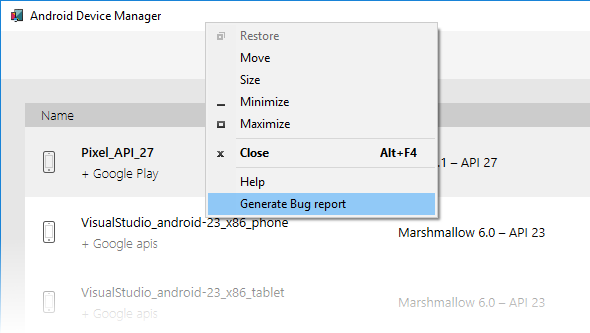 Android Emulator 27.2.7 or later. 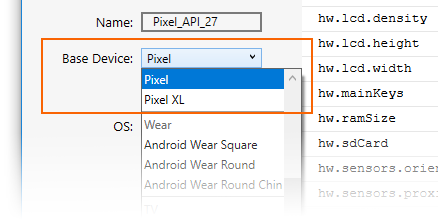 Note that Google Play Store images are available only for some base device types such as Pixel, Pixel 2, Nexus 5, and Nexus 5X. 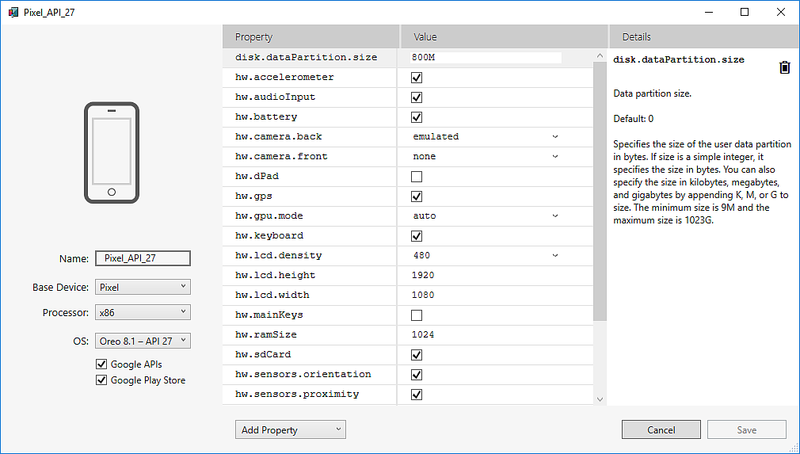 Edit any properties that you need to modify. 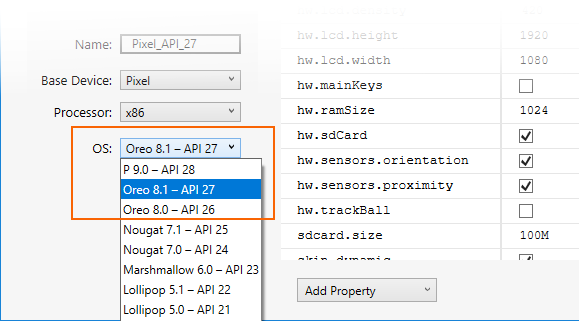 To make changes to properties, see Editing Android Virtual Device Properties. You can also define a custom property by selecting Custom... at the top of the property list. The Device Editor screen lists the properties of the virtual device under the Property column, with the corresponding values of each property in the Value column. When you select a property, a detailed description of that property is displayed on the right. After you have made the necessary configuration changes, click the Save button. 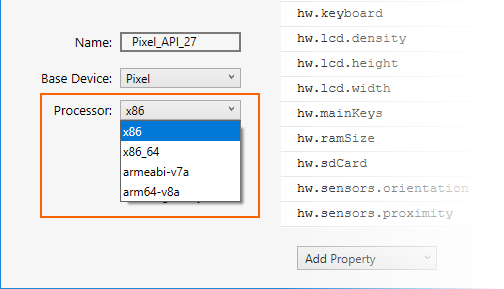 For more information about changing virtual device properties, see Editing Android Virtual Device Properties. 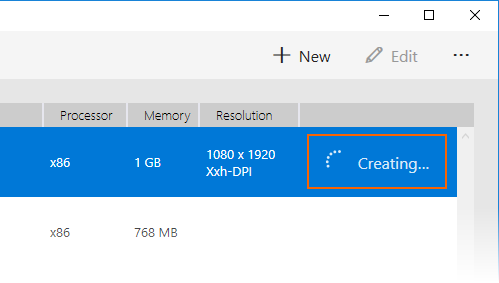 Delete – Permanently deletes the selected virtual device. A dialog box will appear with the reminder that deleting a device cannot be undone. Click Delete if you are certain that you want to delete the device. 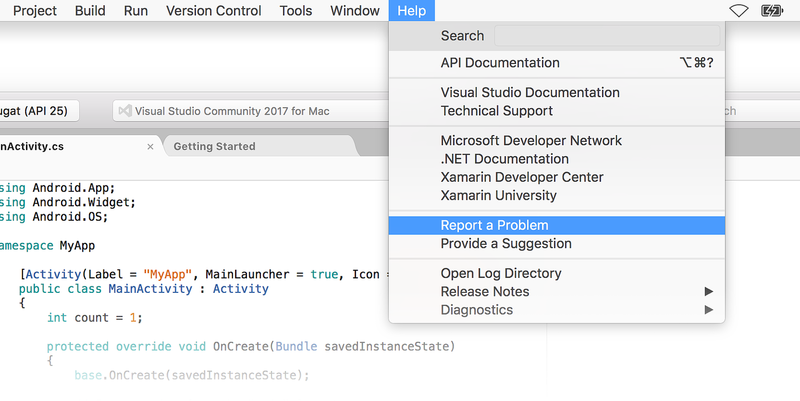 This guide applies only to Visual Studio for Mac. 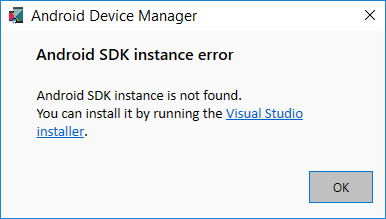 Xamarin Studio is incompatible with the Android Device Manager. 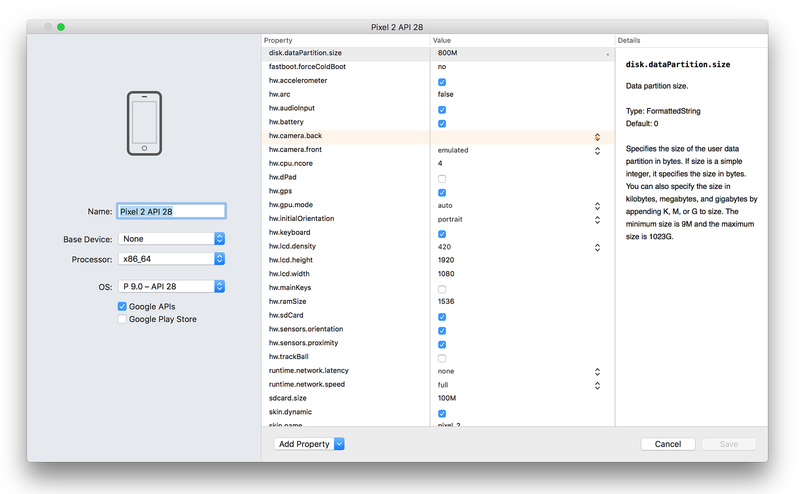 Visual Studio for Mac 7.6 or later. 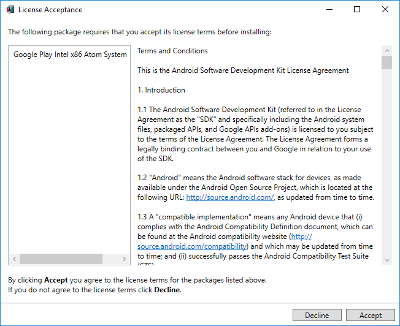 The Android SDK must be installed (see Setting up the Android SDK for Xamarin.Android). Saving the current state will make the emulator boot faster when this virtual device is launched again. For more information about Quick Boot, see Quick Boot. You can also define a custom property by clicking Custom... at the top of this property list. 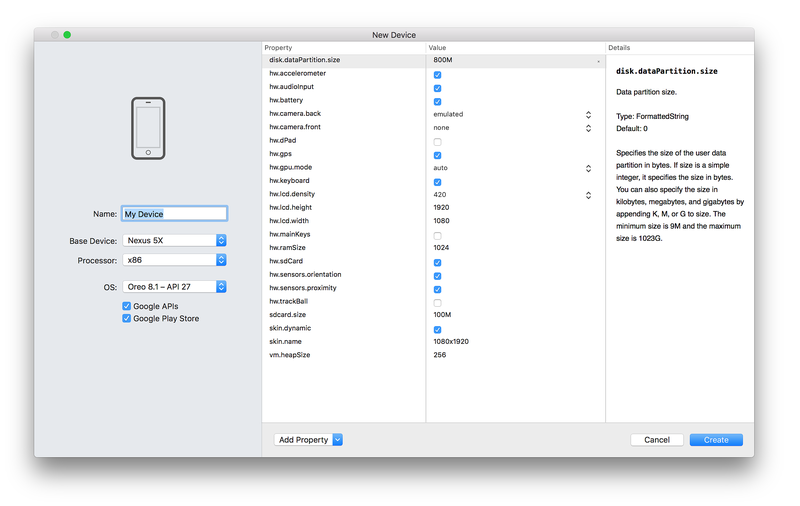 Edit – Opens the currently-selected device in the device editor as described earlier. 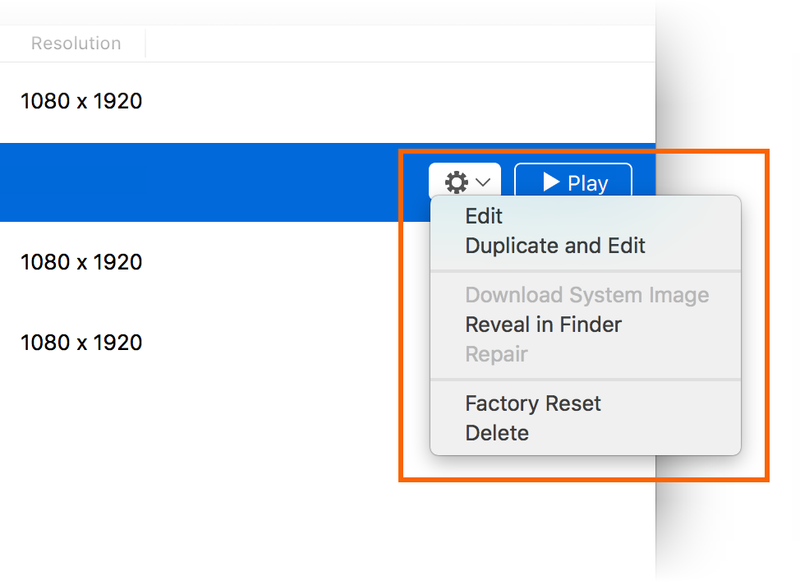 Factory Reset – Resets the selected device to its default settings, erasing any user changes made to the internal state of the device while it was running (this also erases the current Quick Boot snapshot, if any). This change does not alter modifications that you make to the virtual device during creation and editing. A dialog box will appear with the reminder that this reset cannot be undone. Click Factory Reset to confirm the reset. The following sections explain how to diagnose and work around problems that may occur when using the Android Device Manager to configure virtual devices. Navigate to this location and double-click user.config to open it. After making this change to user.config, you should be able to launch the Android Device Manager. If you have an AVD configured for Android Oreo with simulated Wi-Fi access, restarting the AVD after a snapshot may cause Wi-Fi access to become disabled. Select the AVD in the Android Device Manager. 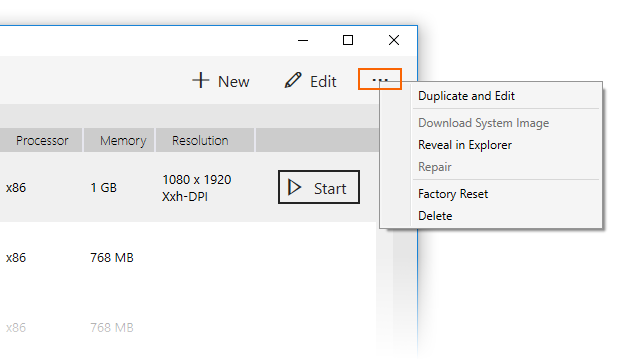 From the additional options menu, click Reveal in Explorer. Navigate to snapshots > default_boot. After these changes are made, the AVD will restart in a state that allows Wi-Fi to work again. From the additional options menu, click Reveal in Finder. 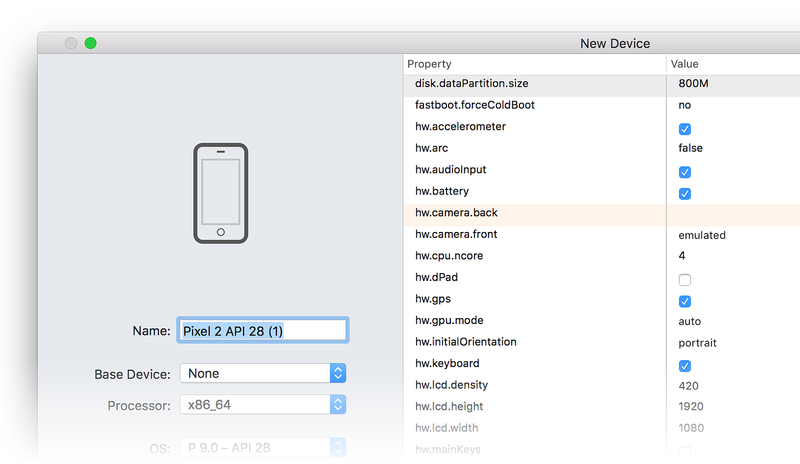 This guide introduced the Android Device Manager available in Visual Studio Tools for Xamarin and Visual Studio for Mac. It explained essential features such as starting and stopping the Android emulator, selecting an Android virtual device (AVD) to run, creating new virtual devices, and how to edit a virtual device. It explained how to edit profile hardware properties for further customization, and it provided troubleshooting tips for common problems.